When I was at school in the late 80s the Tamiya Hornet was my dream car. My friend's big brother had an original Grasshopper and the Hornet was supposed to be a real rocket ship in comparison. At the time the Grasshopper was the fastest RC car I had ever seen and I really wanted the Hornet. Alas, I could only afford the cars in Tamiya's Mini-4WD series, which ironically were probably faster but not RC and much smaller. When Tamiya started re-releasing the older cars in the 21st century I was extremely happy. The Hornet was one of the first kits to return and I bought one immediately. The combination of childhood desires and frankly awe-inspiring box art was too much to pass up. Now after 20 years and having accumulated a great deal of experience with RC, I wasn't expecting to be blown away by turf-shredding performance out of the box. Not being an original kit, there was no need to preserve a valuable 80s collectible so I had no problem considering modifying the kit. Rather than trudge through the monotony of brushed Mabuchi 540-powered slowness I decided to build the Hornet into something that would come close to how I imagined it in 1989. A tamiya 1100mAh NiCad on a modified brushed motor would have been the fast setup in the old days, but nowadays we have some serious fast options available. I chose to run the Hornet on packs of 6 Intellect 4200 SHV cells, through my trusty Kontronik 70-6-18 controller and Hacker C40-8T brushless motor. This has been the mainstay of most of my basher cars since I bought it way back in 2000! It's such a versatile and durable pairing that I've used it in touring cars, pan cars, monster trucks and buggies. You don't get much more versatile than that. The stock super-coarse geared transmission has seen use in many Tamiya cars, even big trucks with large torque demands. This gearbox is therefore very tough and would not have a problem with the added power. I put a bit of super high viscosity silicone lube in the open diff to try to slow it down a bit, and of course switched out all of the plastic bushes for proper ball bearings. This is where the old Hornet design is most lacking. In the rear you get the floating-pod style solid axle suspension which would take a lot of work to improve, but at least it has proper oil-damped shocks (an upgrade over the Grasshopper). The front end is poor to the point of being laughable, with massive camber change from the single wishbone layout and undamped shocks. The springs themselves would be more at home on a ballpoint pen than on an RC car suspension system! This gives the stock front end a very bouncy, difficult to control feel with a lot of bump-steer and not much controllability. Add the extra pace from the modern drive system and this is a recipe for disaster. 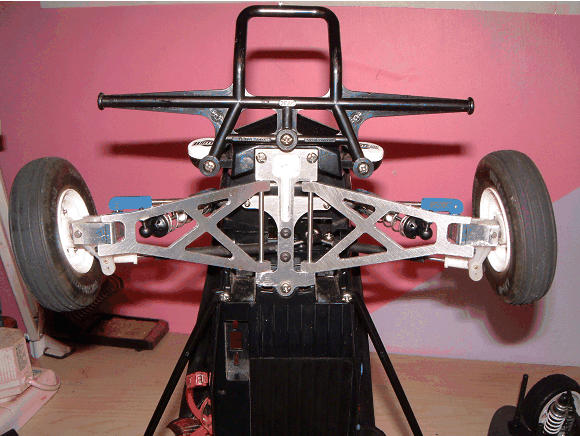 First of all I widened the rear axle to remove some of the tendency to roll over that the extra speed would give. This made the difference between the wide rear and narrow front even more apparent. As the front was so deficient anyway, I designed a completely new front suspension module that could bolt on in place of the old wishbones. Much longer aluminium wishbones were made with steel hinge pins and custom c-hubs which vastly reduce the bump-steer. I cut off the stock plastic shock towers and machined a new tower out of 2.6mm SSG carbon, bolted down to the chassis with a mounting block from 6082 aluminium. 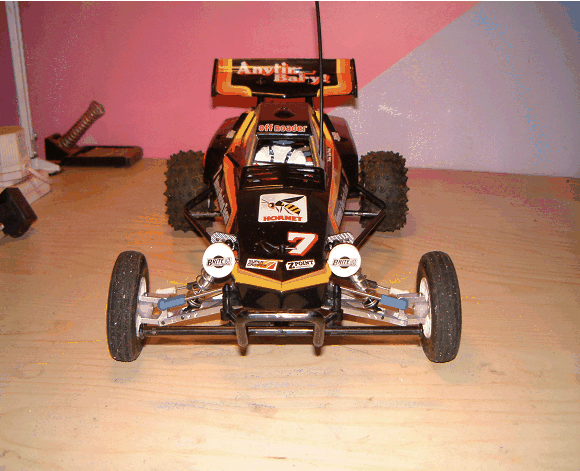 The shocks were replaced with oil-damped items from 3Racing designed for the Tamiya GB-01 mini buggies. The result of these changes was more travel, a much wider track, much less bump steer and hugely improved front-end control. The suspension arms themselves went through 3 design changes before I was happy, the strength around the hinge pins being questionable in the first designs. The only other change up front was to extend the steering track rods to get them out to the extra width. I used some graphite rod which takes out a lot of the flex that you would get with long steel wire rods. Top links were added with RPM rod ends which are very nice and durable. I went straight for the box art look with the body. To fit the new aggressive appearance with the widened track width I mounted the wing further back with a lexan support to get the body a bit longer. Well there's no comparison to the stock Hornet. 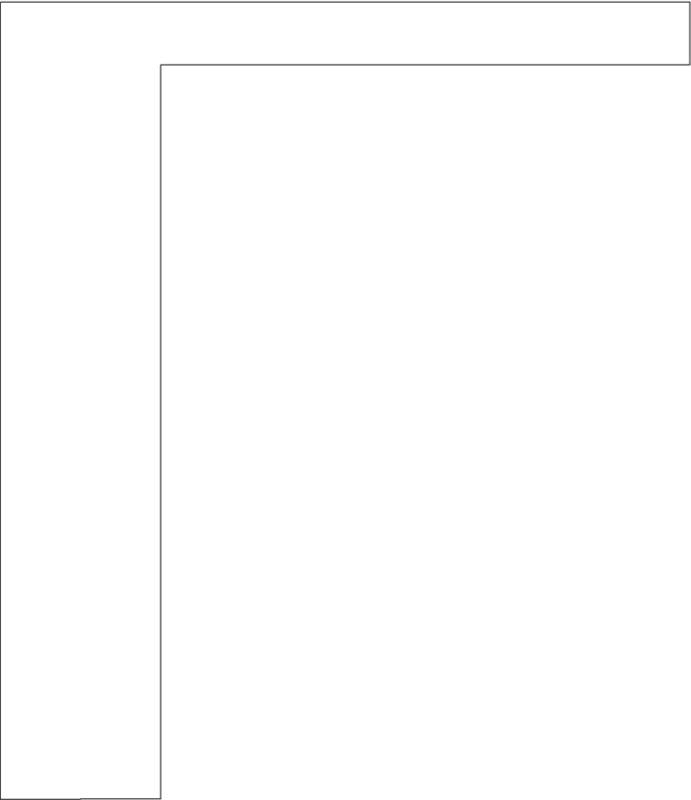 The Ultra Hornet will run rings around the stock machine, and that would still be the case with stock motor power. If it wasn't for the floating-pod rear end it wouldn't be too far off modern buggies either, but that's not what the conversion was about. It has the aggression on the track just like the box art suggests and carries through the looks with much higher performance. New front suspension showing aluminium arms, steel top links, c-hubs and carbon tower with 3Racing oil shocks. Bolt-on suspension module. The stock suspension can still be replaced if needed, although the shocks would have to be mounted to the new SSG shock tower. The original plastic towers have been cut off the chassis.